Welcome to the K.U.A. web site. Karate is for everyone. If you ever wanted a fun and satisfying activity that would tune your mind, body and spirit simultaneously, look no further. Shotokan is the most widely practiced style of Karate worldwide, and one of the most pure and traditional. Within Australia, our group is recognised as one of the largest and most respected organisations practicing and teaching this art form. Karate is not a fighting style - it's a lifestyle that incorporates a measure of fitness, discipline, sensitivity to others around you and a philosophy that will improve the quality of your overall life. That's quite a claim we know, but the proof is right here for you to discover. 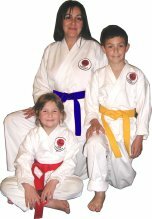 The Karate Union of Australia offers the very best in instruction for Shotokan Karate and, within your training environment, we offer a combination of both time-honoured and modern methods to improve your level of fitness whilst incorporating effective self-defence techniques and improving your life. There is also a very social atmosphere in our Dojos. Sensei Marriott dedicates himself to K.U.A and train's five days a week. Sensei Marriott has represented Australia and W.A. in the Australian Karate Federation in both Kumite and Kata. He has also been involved with international competition at the highest levels for many years. Master Sumi is internationally recognised as a contributor to Shotokan Karate on all levels and is Chief Instructor of many organisations World Wide. Master Sumi began studying Shotokan Karate in 1945 with the Japan Karate Association under Masters Nakayama, Mikami and Ito. Today, Master Sumi is honoured and respected as one the most senior instructors alive today who is still actively travelling the globe teaching Karate-Do. Sensei Sargent was one of the founding fathers of K.U.A. in 1983 and went on to expand the organisation into the internationally respected entity that it is today. His dedication to the teaching of Karate-Do to his many students has also resulted in each of his many Black-Belt successes becoming some of the most senior instructors and coaches operating Dojos all over the country. It is often said that it is easy to see the teachings of Sensei Sargent in junior grades today, even though they may be 2nd or 3rd generation students.